When I say that I think Vincent van Gogh would have loved the album Propeller by GRICE, I’m not talking out of my caboose. Sure, the guy probably would have reacted to modern music about as violently as early man to artificial light – but I’m not talking about strapping ol’ Vinnie down in an easy chair and forcing a set of Koss headphones on his bean until he taps his feet in submission. I’m talking about what he might have thought about the creative process behind the album, which in the case of Propeller is one of the critical components that makes it as good an album as it is. If you ask me, he’d have dug it. You see, it was one of van Gogh’s greatest unrealized dreams to found an artists’ colony, a place where he envisioned kindred souls would come together and thrive in an atmosphere of unmolested creativity and brave invention. For van Gogh, the experiment ended badly and he came out the other end sans an ear. But that was then, and the internet is now – and oh, what a difference a century makes. For the scattered group of collaborators that pooled their powers to create the impressive work of sonic art called Propeller, things have turned out decidedly better. 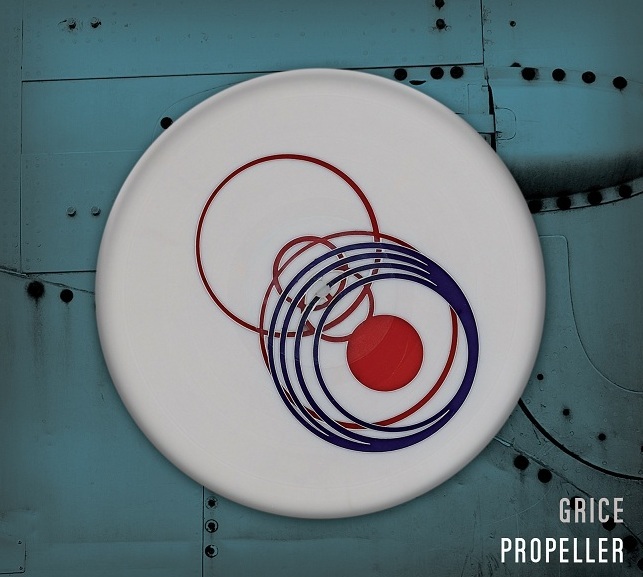 Propeller is a beautifully synchronous collaboration between titular talent GRICE and producer/composer/arranger Lee Fletcher, who’s one of the principal players behind Unsung Productions. Unsung isn’t exactly the artists’ colony Van Gogh bled for, but it’s close to it, an international cooperative of musicians and producers and uber-talented individuals that work both in person and via remote channels on the internet, all with a shared mission to foster creativity, catch it in a bottle, then kick you in the teeth with the awe-inspiring end product. Fletcher’s other Unsung partners are Markus Reuter (a guy that’s played with so many King Crimson alumni that he might as well be named an honorary member), Fabio Trentini (producer and current bassist for legendary Italian proggers Le Orme), and a couple of musicians named Eric Morris and Adrian Benavides, whose mutual residencies in central Texas have ramped the coolness factor of the Lone Star State so high that I’ve now got two more reasons to want to make Austin my future home. As for Fletcher, he’s much more than just a producer, and in many ways his contribution is what makes Propeller come alive beyond what I’ll call “the aural spectrum” (even though it would probably be a lot less pretentious to just say “the stuff you hear”). Whatever your semantic preference, GRICE’s Propeller is the kind of album that was designed with the intent of being seen as well as being heard. The music and vocal performances blend varied and subtle elements of 70s-era Harry Nilsson here, a dash of Jeff Buckley there, and a heaping spoonful of melodic sensibilities everywhere the ear can roam. Meanwhile, the production utilizes the eclectic instrumentation of trumpet, sax, french horn and touch guitar to create an impeccable ambiance that gives Propeller a wholly cinematic feel. And then, of course, there’s GRICE himself – the central jigsaw piece that holds the project together and stamps it with a musical identity so unique and mature that it makes you wonder why he’s just now getting around to recording his first official album. There’s a good answer to that, of course. Apparently, he spent years paying dues fronting a couple of bands named Swanston and The Martyrs, neither of whom I’d ever heard before. But if the audio clips I found online are representative of their sound, it’s apparent that GRICE was biding his time for the right moment to break free in solo flight. The aptly named Propeller is the embodiment of that flight, a collection of well-crafted songs so deeply intimate and personal that you almost want to ask “Should I be hearing this?” Well yeah, of course you should – and since he can’t do it from wherever he is, you should also do it for van Gogh. Propeller by GRICE is distributed by Hungersleep Records and is available in both digital and physical CD format through the Burning Shed online store. The album features guest appearances by Markus Reuter, 05Ric, B.J. Cole, Luca Calabrese, Alan Burton, Fred Ehresmann, Jacqueline Kershaw, Jerri Hart, Joe Breban, Lisa Fletcher, Jim Peters, Alexander Marchant, Ondrej Pochyly, Raphael Ravenscroft, and Steve Bingham.